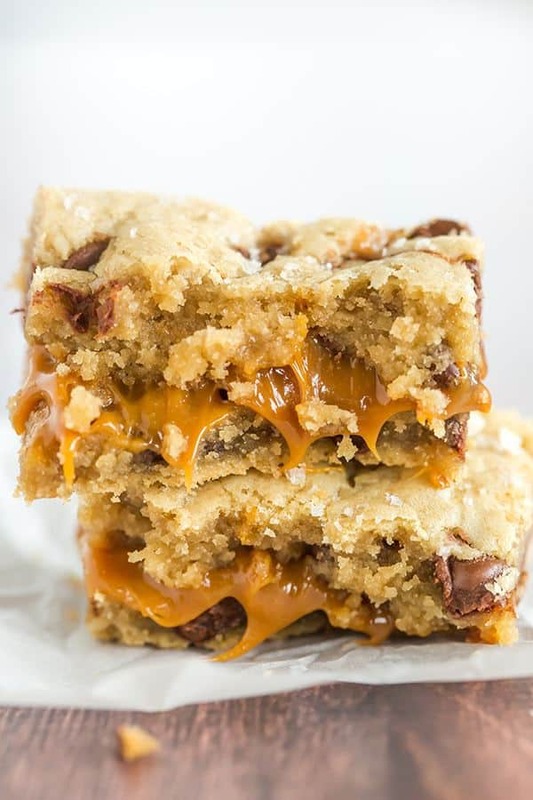 Salted Caramel Chocolate Chip Cookie Bars – A layer of salted caramel sauce is sandwiched between layers of a favorite chocolate chip cookie dough recipe, then topped with a sprinkle of fleur de sel. Over the last handful of years, I’ve become completely obsessed with salted caramel. Ice cream? Pass me a spoon. Popcorn, Pretzel & Peanut Bars? Hand me at least three, please. Brownies? You may as well just give me the entire pan. Growing up, I never gravitated to caramel sauce as a topping option, sticking with hot fudge as my old standby. Perhaps it was because I never had great caramel sauce, and it always seemed sickeningly sweet to me. However, once I tried my hand at a homemade salted caramel sauce, I did a complete 180. 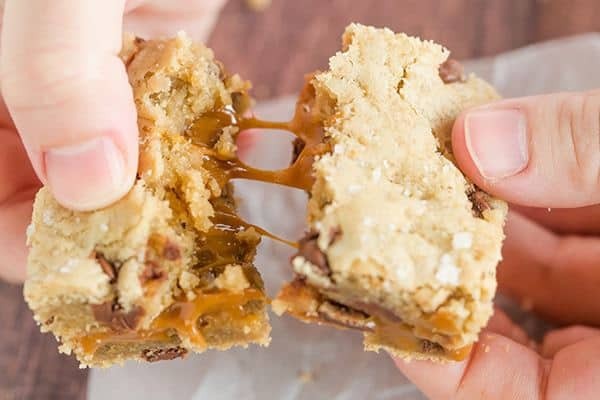 Now, combine salty caramel with a favorite chocolate chip cookie recipe and you have something I absolutely, positively cannot stop eating. 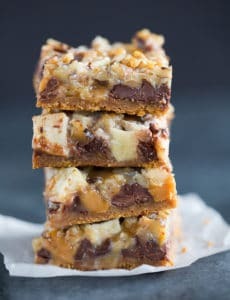 In this particular instance, I adapted one of my favorite chocolate chip cookie recipes into bars, added a layer of salted caramel sauce in the middle, and then sprinkled the top with more flaked sea salt, just for good measure. Kudos to Maria over at Two Peas and Their Pod for creating such an amazing concoction. She really is the cookie queen! 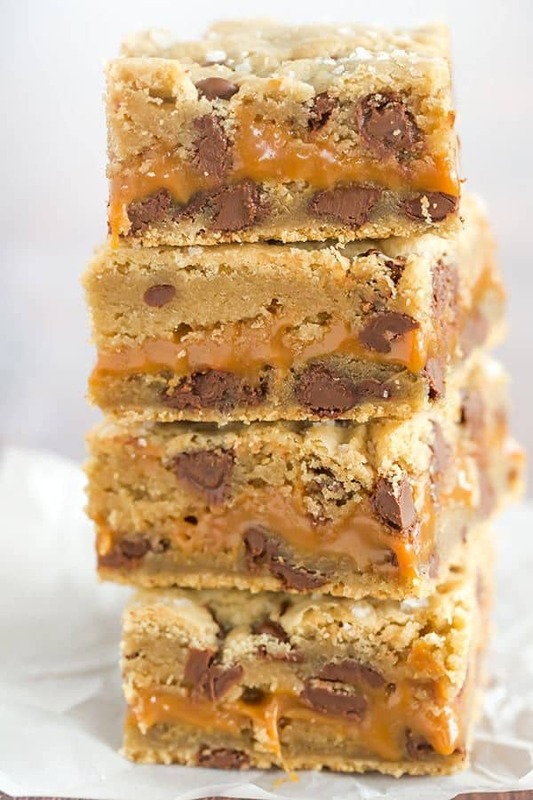 These salted caramel chocolate chip cookie bars are incredibly easy to throw together, thanks to a shortcut caramel sauce. If you’d prefer to use a homemade salted caramel sauce, that will definitely work! Just make sure you let it thicken up a bit, and then use enough for a thin layer over the cookie dough. These set up and keep for me perfectly at room temperature, but if your house or kitchen is a little on the warm side, you may need to pop them in the refrigerator to allow the caramel layer to set and to keep them from getting too messy once you cut and store them. And on that note, these are an excellent candidate for freezing. I would just cut them, wrap each one individually in plastic wrap and then pop them in a freezer-safe ziploc bag. I need to get a batch in my freezer for upcoming nights on the couch snuggling a newborn and Netflix-ing! 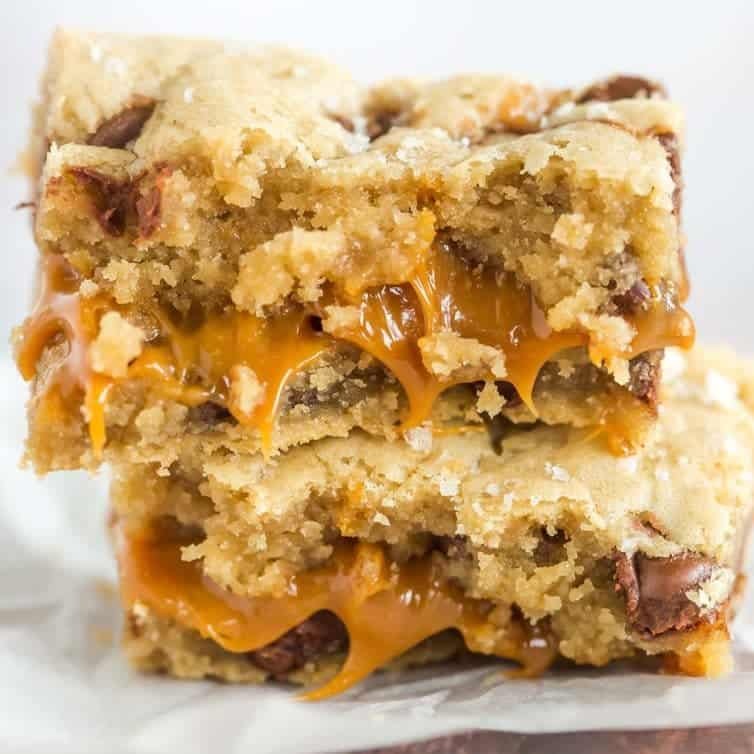 If you love chocolate chip cookies, caramel sauce, and sweet and salty combinations, you absolutely, positively have to make these salted caramel chocolate chip cookie bars. They will become one of your favorite desserts (or snacks, or breakfast *ahem*). 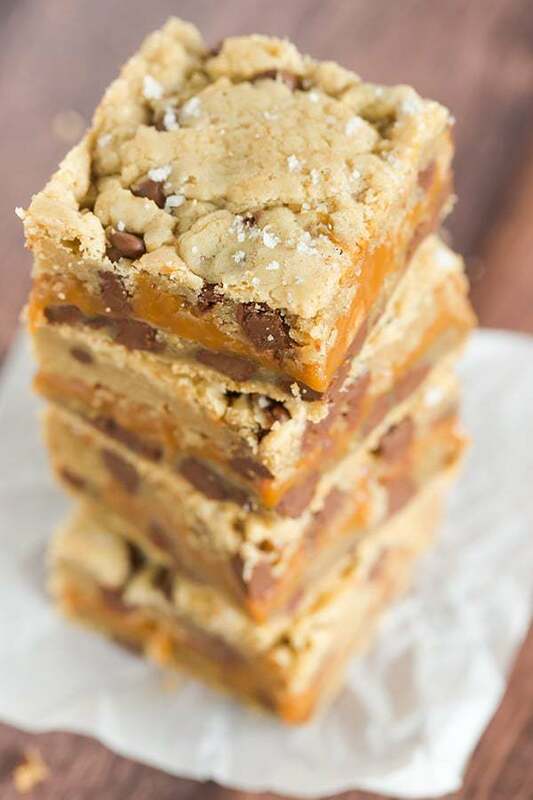 These cookie bars are the ultimate for chocolate, caramel and sweet & salty lovers! Preheat oven to 325 degrees F. Grease a 9-inch square pan and line with parchment paper; set aside. 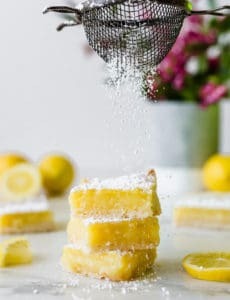 Using an electric mixer, mix together the melted butter and sugars on medium speed until combined. Add the egg, egg yolk, and vanilla extract and mix until smooth. Slowly add the dry ingredients and mix on low, just until combined. Stir in the chocolate chips. In a medium microwave-safe bowl, combine the caramels and heavy cream. Microwave on high until the caramels are melted, stirring every 20 seconds. This will take about 2 minutes. Press half of the cookie dough into the prepared pan, smoothing the top with a spatula. Pour the hot caramel over the dough cookie dough and spread into an even layer, leaving about ½ inch around the border. Sprinkle the caramel with sea salt. Drop the remaining cookie dough in spoonfuls over the caramel and gently spread the dough with a spatula until the caramel is covered. Sprinkle the bars with additional sea salt. Bake for 30 minutes, or until the top of the bars are light golden brown and the edges start to pull away from the pan. Place the pan on a wire rack and cool to room temperature, then refrigerate for about 30 minutes to allow the caramel layer to set. Cut into squares and serve. Store leftovers in an airtight container at room temperature for up to 4 days. This recipe was originally published on February 22, 2012. I made these and double the recipe for the dough for a 9×13 pan like many comments said, however I don’t think it needed to be doubled and could have just been multiplied by 1.5. They ended up very thick. Also I didnt double the caramel and there is still plenty. Used a glass dish, didn’t adjust the heat so they took longer. Halved the caramel sauce as I didn’t have enough caramels to make the full recipe but it was enough to cover. Waiting for them to finish, looking yummy! The recipe states one egg with yolk, but the video on FB clearly showed two eggs going into the mixer. Did the recipe get doubled for the video? Thanks! I’m sorry if the video is not clear, but it was not doubled – it should be one whole egg and one additional egg yolk. Enjoy the bars! 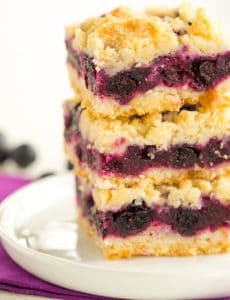 I love baking and I have tried some of uour recipes and I can’t wait to try these. Thank you for posting your recipes..
Good morning! Planning to double the recipe and use the salted caramel sauce (about 1 1/2 cup). If I use the sauce, should I omit the additional cream and the additional sea salt on top of the sauce? And just put the salt on the top layer of dough? Hi Carolyn, Yes, you can omit the cream and salt, and just use the straight sauce, then sprinkle the additional sea salt on top of the dough. Enjoy! 1. You grease the pan and then put the parchment paper on top? 2. 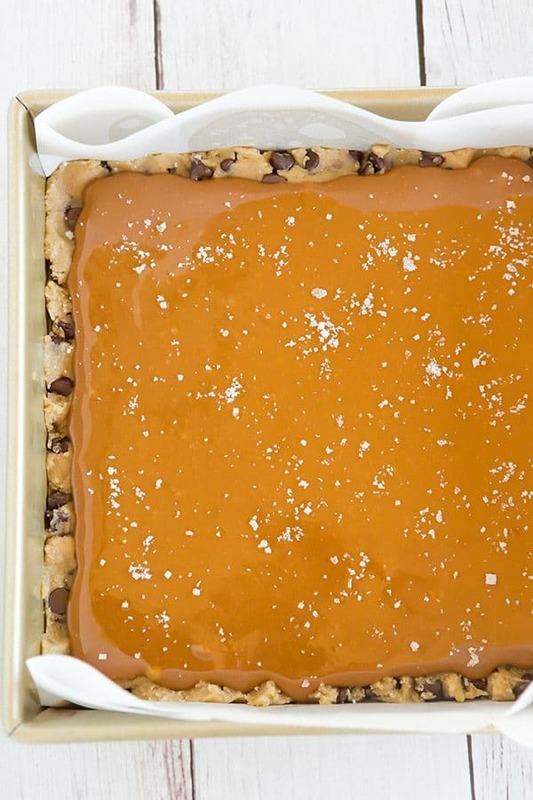 If you had to guesstimate, how much sea salt do you put on top of the caramel and then on top of the cookie dough? 1. Yes – I just find it helps to keep the parchment in place. 2. I literally just use a pinch between my fingers, so maybe 1/8 to 1/4 teaspoon each. Did anyone else have trouble with the middle sinking a bit but the edges staying tall? What is the calorie count for the salted caramel chocolate chip bars? Hi Val, Unfortunately I don’t have that calculated, but you could do so on a website like MyFitnessPal. I made these last night. They were a huge hit at the office today. Everyone said they were delicious and a few asked for the recipe. I will definitely make them again. I’m so happy to hear they were a big hit! Thanks so much for stopping back to share your review, it is much appreciated! Not everyone can eat sugary treats and/or chocolate. People who are diabetic or on a diet can’t eat this. It looks Delicious. I have made this several times, always a crowd pleaser! 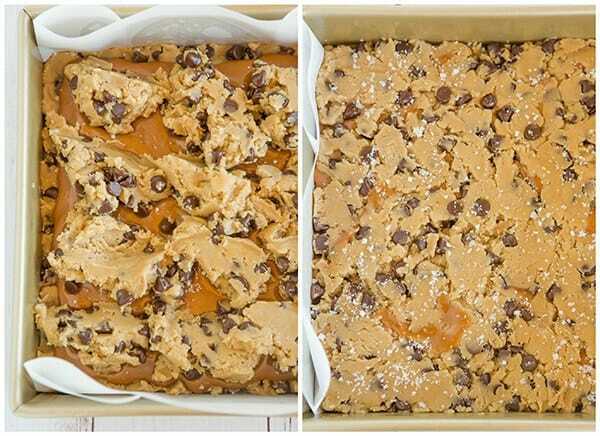 can u double the sea sat caramel chocolate chip bar recipe to put in a 9×13 ???? Directions say to grease pan and then line with parchment. Should that be reversed? Hi Beth, Nope, greasing helps the parchment to adhere to the pan and keeps the exposed sides non-stick. I am allergic to dairy. What could I use in place of the heavy cream?? Hi Jodi, I’m honestly not sure… coconut milk MIGHT work, but obviously the flavor would come through. I’m not sure if something like almond milk would thicken the caramel sauce enough, but you could give it a try. Can you double the recipe for a 9×13 for bake sales? This recipe is AMAZING!!! The salt makes the difference. I used flaked salt I happen to find in our grocery store in the baking section. I think my husband and I ate a whole pan! We kept going back for little nibbles. Really easy to make too. I have made these several times…all the guys at work flipped over it…my class in school loved it….my co-workers kived it but best of all….I LOVED IT! Will I need to make any changes to the recipe or cooking time in order to use an 8″ square glass pan? Hi Kevin, You may need to increase the baking time just slightly. Enjoy! These were the worst bars I have ever made. I made them exactly as the recipe. The bottom layer did not bake and it ended up a gooey mess. Oh, my. How am I just now seeing this?!!! (It was posted 5½ years ago.) I am drooling for them NOW and will make them VERY SOON!